If I’m moving, I’m moving fast. Fast, fast, fast. I talk fast, walk fast, think fast. Before my feet hit where I’m going, my mind has already been there and is movin’ on to my next destination. Fast, fast, fast. So when I was blessed with a little boy to have in tow every day, it just seems fitting that the universe decided to give me not a fast mover and shaker like myself. Nope, my main man moves a little slower. Try Poky Little Puppy slow. While he reserves this tortoise like speed for our walks to the car in a parking lot, down the long hallways to his preschool class, and his usual morning routines, he isn’t always slow. He feels the need for speed when it serves him best: beating his sister down the stairs to get his little hands on the iPad first, if I offer up a dessert (super-fast if it’s ice cream), or if I’m yelling STOP as he runs into the ocean or a pool. He already has that selective hearing thing down. His snail’s pace wasn’t noticeable until his sister came along and he lost my hip as his major mode of transportation. When he moved up to the big brother role, he had to hoof it next to me and I’ve been slowed down ever since. If you see me moving towards you at lightning speed, take a look a few yards behind me, that’s where you find my boy. Just strolling along, no sense of urgency, taking it all in. Daily I plead with him to pick up the pace; however, my pleas fall upon those little ears with selective hearing. When I’m on the move, he’s behind me hop, hop, hopping on just the blue floor tiles at school because the white are full of “hot lava.” If I’m darting down the mall, he will be dragging his feet and trailing his hands down the wall making sure to touch every crack and crevice. If there is one thing I’ve learned as a mother (besides my amazing abilities to pass back juice and Goldfish crackers to my backseat passengers while never taking my eyes off the road and that no one tells you that your feet get bigger with each pregnancy), if you can’t beat them, join them. So goodbye fast, fast,fast days. You can find me strolling alongside my guy, playing I Spy, and checking out the view from his perspective. Now someone tell me what we do about this selective hearing. If you figure out the answer to the selective hearing thing, please do share. I have picked up six year old up more time than I can count before he’s is poky, too! Haha!!! Same here! My son is only four and is really, really tall. So he looks ridiculous when I carry him, but a lot of times I am grabbing him and just dragging him along to hurry him up. This is something I have to be conscious of every day. At the rate I’m going, my son is going to know me as the Mommy who says, “C’mon buddy. Let’s GO!” every 5 minutes. I really need to stop hurrying him and remember that his perspective is the better, healthier one. Thanks for the reminder…I need lots of them! Same here, Wendy! It’s so hard not to just go, go,go and it drives me bananas to always tell him to hurry up. 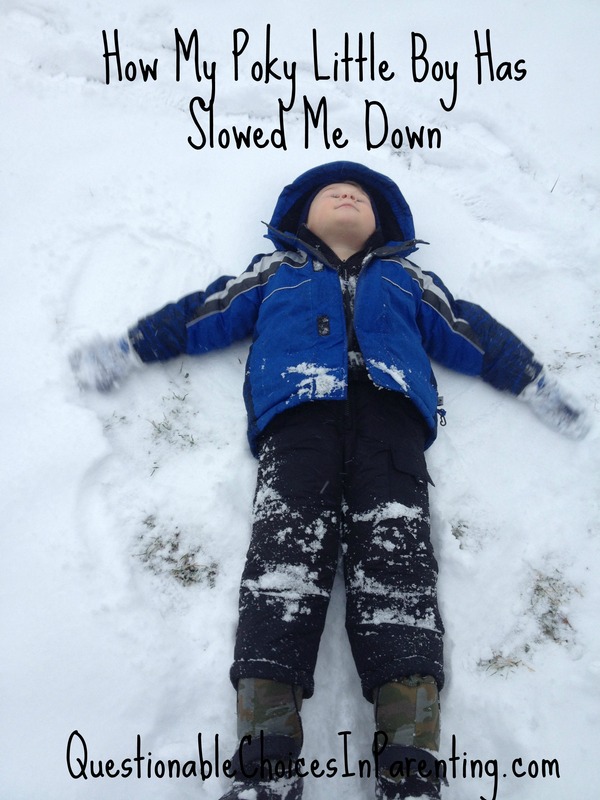 However, I really am trying just to slow it down a bit and enjoy my time with my slow moving boy…. it just adds three hours to my day! I feel the same way about my middle child, she is a slowwww poke! lol!! Ha! I’m sure some day they will say we are slow but until then HURRY UP!!!! Only the blue tiles–that is SO BRADY! He does the exact same thing, and is the slowest of the slow when I need to go go go! As for the selective hearing, I think they come by it honestly. And by honestly I mean their fathers. Ha!! Well I do like when he gets a little chunky—dear lord I have issues. Yes, the selective hearing is genetic. He looks like his dad, he stands like dad, and he has his dad’s selective hearing. Huh. My 4 1/2 year old has that selective hearing, too. And what’s up with them running directly (and too quickly) towards danger like gigantic waves in the ocean (he can’t swim, either) but not hurrying up at the store? Argh! Boys! They must want to drive us bananas!!! I feel like all I ever do is grab is hand and drag him along. It’s exhausting. I guess all I can do now is slow myself down, right? This could have been written about my 3 year old daughter and I. I love this post! Thank you!! Good thing those slow pokes are so cute! I am totally guilty of hurrying along my poky kids too. And if there is a solution to selective hearing, then I would love to know it too. My middle daughter has the worst case of it ever! Love this, my kids are busy and the only time I am waiting is when we have to go to school…lol! But I love the moments we slow down, it is more quality time. Love this! My 6yo daughter is the same way – what should be a 10 minute walk around our block takes us an hour because she’s distracted by every little thing, walks backwards, and just takes her time! It really makes us look at the world differently. My kids do this too! They walk slow on purpose, but of I waves candy in front of them they’d fly! This is so true! Sometimes we do have to slow down to see life at their level. My son is poky too, unless it’s for something he wants to do. Both kids have the selective hearing down. I’m still waiting on a solution for that, lol. My son does this all the time. I have to go with the flow. I, too, seem to find my feet moving much faster when there is dessert at my destination. LOL!! Isn’t it amazing?! When my daughter was born, she was just the same pace as I was, because she went everywhere with me. It was just us – her dad was usually off doing dad things. Fast forward 6 years to my sons birth. He’s fast paced. Now I notice that my daughter is a slow poke. Every.single.thing we do takes her forever to get ready for, get done, or get together. Not him – he’s right on time, right there with me, and finished first. My little one is turning 3 and is getting into that phase as well. It frustrates me sometimes but then I learn to laugh about it. cute post! I have 5 kids ages 8 yeas to 9 months, they have slowed me down because they were me out! LOL! My son moved at his own pace too and there wasn’t a thing in the world anybody could do to speed him up. I learned to plan around him eventually. One day he will speed up and you’ll be running after him, and you’ll wish for the days when you were the faster one! Kids definitely move at their own pace, and it never seems to match ours! It is important to learn to let our children go at a child’s pace rather than rushing them to go at an adult rate. My daughter has snail pace mode too. It’s the age. My 5 year old is the same way and has always been like that. Especially when I have an appointment or when it is time to go to school. The pokiness and selective hearing only gets worse as they get older. When they turn into teen another wonderful feature is added, sarcasm. Good luck. I constantly do that with my son, I have not yet learned he has his own pace and way of doing things and need to plan my day according to that. That’s part of being respectful with each other, but it’s not always easy to do, with my busy lifestyle. haha…this post is great. I bet he walks slower when he know you’re in a hurry!